October, 2015 | Corporate Solutions Inc.
Are you putting retirement savings on hold? “Jessica Hand and Mike DesRoches are juggling numerous financial goals, but saving for retirement is one ball they’ve had to let drop over the last year. After the mortgage payment and other bills, the couple are barely breaking even. In fact, they recently dove deeper into debt to fund Ms. Hand’s tuition for graduate studies and a DIY basement bathroom renovation – all in the midst of expecting their second child,” wrote Joel Schlesinger for The Globe and Mail on October 22, 2015. Schlesinger continued, “Moreover, savings rates are declining, too. Only 28 per cent of workers age 25 to 34 make RRSP contributions while only 34 per cent of those between age 35 and 44 contribute. A decade ago those figures were 36 and 42 per cent respectively, according to StatsCan data. And overall personal savings rates have fallen from 20 per cent of household income in the early ’80s to less than five per cent in 2010. Yet over the last 20 years, wages have grown even if Canadians’ capacity to save has not. In 1985, median household income was about $24,000 – or about $48,000 in today’s dollars – while in 2012 median household income was about $77,000, according to StatsCan data. “It was the perfect day for some welcome healing – a warm, midautumn sun, mostly blue skies and a gentle breeze. The specific occasion was to pay tribute to the average citizens and first responders who raced to help, but could not, one year ago; to the police and security personnel who risked their own lives to protect others – but most of all to the two soldiers who were hunted down and killed for reasons that will forever escape. The larger occasion brought together the country’s three most significant personalities of the moment: Stephen Harper, the current Prime Minister of Canada, Justin Trudeau, the prime-minister-designate and David Johnston, the Governor-General who will hand power from Mr. Harper to Mr. Trudeau on Nov. 4,” wrote Roy MacGregor for The Globe and Mail on Thursday October 22, 2015. MacGregor continued, “With their families present, with a 21-gun salute echoing across the Ottawa River toward the orange hills of Gatineau and with a CF-18 flypast in the “missing man” formation, the two fallen soldiers were honoured with wreaths and tributes and prayers. By far the most compelling moment was the simple wreath jointly laid by Mr. Harper and Mr. Trudeau, who then silently returned to their chairs, separated only by Laureen Harper, quickly shook hands and then bowed their heads in whatever private thoughts such a week and such a tragedy brought. 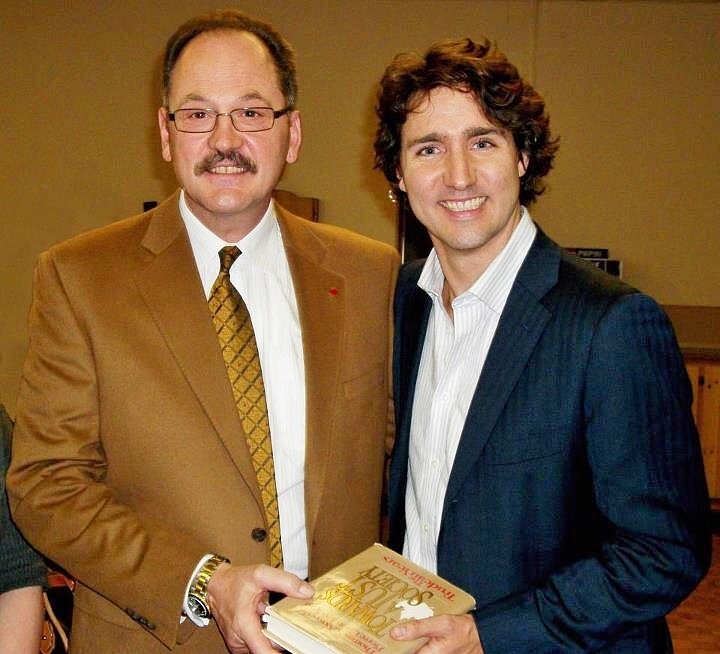 “Liberal Leader Justin Trudeau has named a former senior Ottawa bureaucrat, Peter Harder, to head his transition team, sources said Tuesday, as the incoming prime minister turns his attention to forming government after a winning decisive majority in Monday’s election. The Liberals won 184 of the country’s 338 seats, capturing 39.5 per cent of the vote as the appetite for change drove the party from third place in Parliament to first with the largest increase in seats in an election in Canada’s history. Mr. Trudeau has scheduled a 2 p.m. rally with supporters in Ottawa and a 5 p.m. news conference at the National Press Theatre across from Parliament Hill,” wrote Shawn McCarthy, Bill Curry and Daniel Leblanc for The Globe and Mail on October 20, 2015. McCarthy, Curry and Leblanc continued, “The incoming prime minister faces some pressing issues that require immediate attention. He must decide whether Canada will ratify the Trans-Pacific Partnership, the 12-country trade deal that could mean major changes for the country’s supply-managed agricultural sector, auto industry and digital economy. During the campaign, Mr. Trudeau said he needed to see the text of the agreement before deciding on a position. His decision may be helped by the fact U.S. President Barack Obama may not have the support needed to win approval in the U.S. Congress. He also has a heavy schedule of travel in November, including a trip to the Group of 20 meeting in Turkey, where Middle East conflict will be prominent on the agenda. Mr. Trudeau has promised to end Canada’s combat participation in the air war against the Islamic State in Syria and Iraq, and will have to explain that change to NATO partners, including the United States.